Kevin Lyons from Melview Lodge compiles angling reports for the area for many angling information sources, and these are compiled on this website. To view an archived report please use the drop-down lists to select a year and month. Sean with another great Pike - It really was a great trip! Kevin from Melview Fishing Lodge in Longford welcomed Sean and friend Bill from Dublin through the doors after a little lay off for Kevin due to a back operation and refurbishments to the lodge. Sean and Bill, who are no strangers to Melview were straight off to do some fishing. 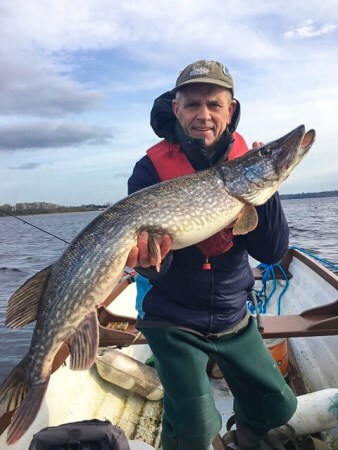 The weather was unpredictable at times and high winds out on the water made it difficult at times for the guys, but the lads braved the weather conditions and produced a good number of Pike to 25lbs using various dead baits. Bill hopes to be back within a couple of weeks and Kevin himself hopes to be back in action in a week or so, thanks again lads and hope to see you again soon!